The San Diego County Board of Supervisors Tuesday directed staff to move forward with a plan that advocates say will allow the criminal justice system to better handle residents with mental health issues. — work with school districts and the county Office of Education to develop a school-based crisis response system, including possible expansion of existing psychic emergency response team. Robbins-Meyer will work with the District Attorney’s Office and the Sheriff’s Department to develop the plan and then return in 90 days with recommendations. Board Chairwoman Dianne Jacob said the action will allow the county to focus on the individual, not the system. Last October, the board held a conference on behavioral health treatment, with a focus on the overall system. 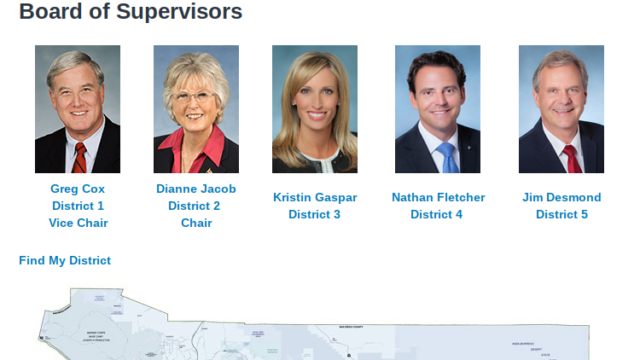 Supervisor Kristin Gaspar called Tuesday’s vote a “critical first step,” and added that while the county spends $658 million on behavioral health treatment, it must also work with colleagues on both the state and federal level. Luke Bergmann, county director of behavioral health, said the Public Consulting Group will also help the county by designing services and finding a revenue source.